The actual tornado that was way too close. This shot is from I-35 and Waterloo looking back in our direction. It was less than a year ago that I was telling the story of crawling into the under-the-stairs closet with Riley during a tornado warning and here I am telling the same story once again. We were expecting rain, but an F-3 tornado less than a mile from our house? Not so much. 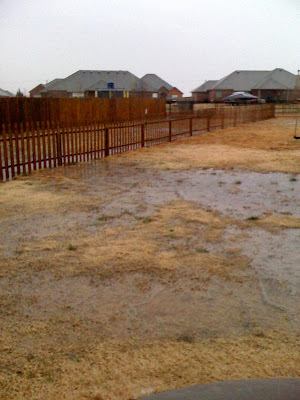 Riley and I had been in the backyard playing when I could tell the rain was coming. Thinking nothing of it, we headed inside, turned on some toons and were hanging out like any other day. I called Kevin and learned that there were some storms in the area so I switched over the TV. Um, yeah. Storms quickly became tornado, which quickly became headed straight for us. The always reliable satellite went kaput right about the time things started getting bad and the hail was flying. Kevin was trying to talk me through the radar reports as I am freaking out. He tells me it's a tornado warning and I should probably take cover. So, I grab Riley, head to the stupid closet, and within a couple of minutes, we lose power. Poor Riley didn't freak at all. In fact, he was freakishly silent during the whole ordeal of being in a pitch-black closet while his mother is losing her mind on the phone. The short story is that it missed us--again. This time, however, it was even closer than our last close call. It was less than a mile. Less. than. a. mile. And for real. Kevin started racing home after the storm passed and it took him forever because so many roads were closed off. He actually had to show his ID with our address on it to make it past the last of the closures. Our electricity was off for about 6.5 hours so we finally headed out for food and light and saw some of the damage. It is NUTS how close this sucker was. I'm going to make myself a shirt that says says "I hate tornadoes." We are the lucky ones and I'm thankful we are safe and sound. 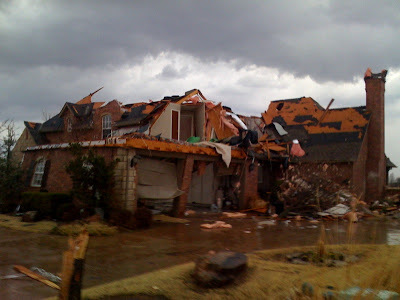 Seriously, lived in Oklahoma 30 years and have not had the tornado action I've had in this ONE house in the LAST YEAR. Get me out of here! The storm from I-35 & Waterloo. *Note the flying debris. building made a nice dinner for Mr. Twister. 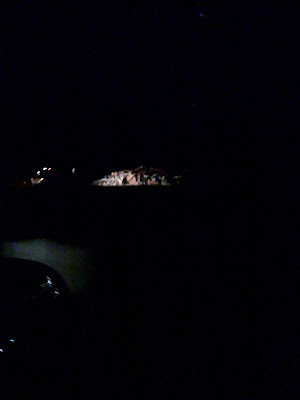 (Hard to see via iPhone in the super dark. 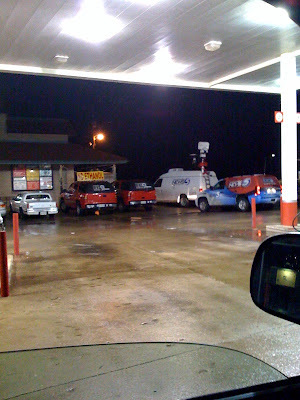 The gas station down the street proved command central for the news crews. hit here and everyone got into the coolers for shelter. The cure for no power and surviving a tornado scare? 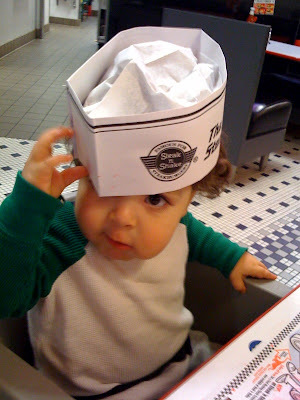 Steak 'n' Shake. Not even exciting by comparison. 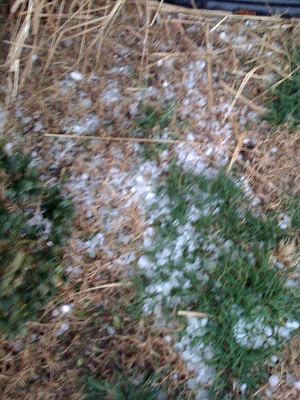 Pics of a small pile of hail and our backyard swamp. This is what's called being lucky, which we are. So scary. Edmond is known for its tornadoes and Kevin can tell you that we had quite a few close calls as kids. We never got hit, though. Scary. Scary. Scary. I am so glad y'all are ok! You guys HAVE had major tornado action up there...wow! I'm glad you guys (and your casa) are safe and that Ri-guy didn't freak! 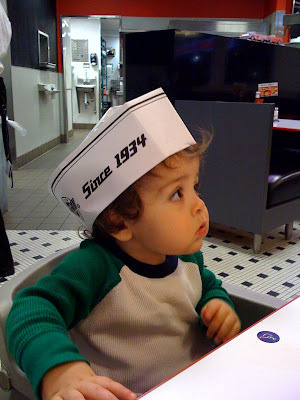 Love the steak n shake pics!!! I tried texting you when I saw that the tornados were headed your way, but none of them would go through! I swear you guys are tornado magnets!!! Okay...about the Steak and Shake...didn't know we had those here. I've wanted to try one. I see an outing in our future.